The home of The Brady Bunch, where so much of the show took place, was always a bit of a head-scratcher: A mid-century modern house, featuring a giant staircase right on the middle of it, and six kids crammed into two bedrooms with one bathroom between them all. But the deceptively bland decor always took a back seat to whatever domestic squabble the Bradys were grappling with, like cheerleading competitions, teeter-totter world records, and any number of school plays and performances. One person has decided to delve deeply into the art that the Bradys (or rather, their set designers) decided to hang on the walls of the home, and it’s an alarmingly exhaustive exploration. Kirk Demarais, author of Mail-Order Mysteries: Real Stuff From Old Comic Book Ads and Life Of The Party, teaches art, advertising, and design history at John Brown University, and has written up a new piece for website We Are The Mutants called “Pork Chops And Apple Sauce: Appraising The Brady Bunch’s Art Collection.” Demarais has so meticulously gone over the Bradys’ various wall-hangings, his descriptions would seem obsessive if they weren’t so entertaining (or vice versa). Demarais goes through the home room-by-room, from a prominent horse statue that also showed up in Bewitched, to a pair of Lionel Barrymore etchings in the family room, to the candy-colored psychedelia of the Brady girls’ posters and what appears to be a bloodstained clown in the boys’ room. It’s almost a master class in what artworks look best hung against a backdrop of wood paneling. 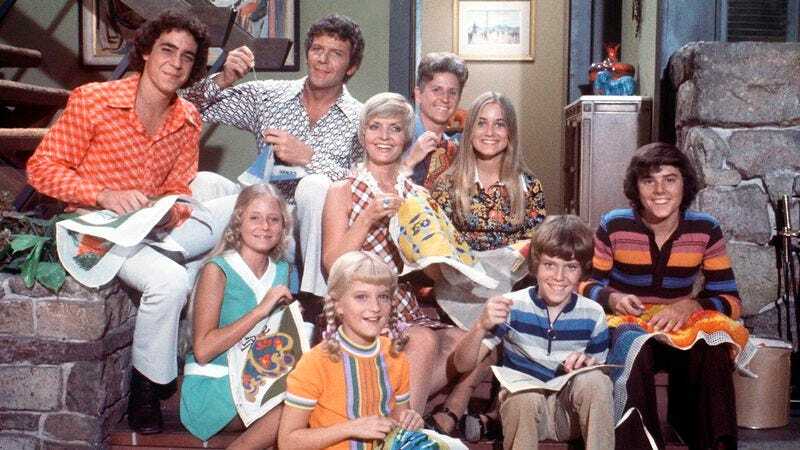 If you’re ever seen a single Brady Bunch episode (or even just the ’90s homage movies), a trip through this article will astound you as to how much you’ve missed, as well as the role that interior design can play in TV creations overall. In the Bradys’ case, a lot of these decisions were likely based on what was hanging around the studio prop room at the time, but still resulted in the show’s indelible impact.